I have always enjoyed white button mushrooms. Just give them a quick saute and they are so delicious with that nice earthy taste. Some people like them raw but I don't, especially knowing what they are grown in. There are brown button mushroom, which cost more and I don't believe I have tried, although I might have. I'll just have to try them again sometime. I do not enjoy portobello mushrooms as I find the taste too strong and have yet to experiment with other varieties. Lately though, I have got back into using mushrooms regularly, even though Teena does not enjoy them. I have them in my eggs for breakfast and in my pesto pasta. I never knew how to store them properly without them getting slimy. I was told putting them in a brown paper bag on the counter works. It doesn't. They get slimy, as they do when you leave them out in their original package or in the fridge open. I found that once the package is opened, it needs to be rewrapped in plastic wrap and stored in the fridge. It is also helpful to take them out of the package, place a paper towel on the bottom, put the mushrooms back in and again, wrap them again in plastic wrap and place back in the fridge. Now, how about the health benefits. Do mushrooms have any nutritional value? I doubted it but surprisingly they do! 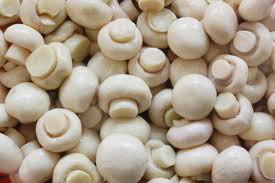 According to an article on Fitday on white button mushrooms, they have a good list of nutrients, have more potassium then even bananas, and are an excellent source of Selenium (12% of the RDA), which combined with Vitamin E protect body cells from free radicals. As mushrooms are mostly water (80 to 90%), you get great taste at the cost of very few calories. I am a Fitday member so I logged in to see what was in one cup of sliced mushrooms. I saw that they contained only 15 calories, 0.2 grams of fat and 2.2 grams of protein. Since I use a lot less than that in my scrambled egg, I am getting great added taste and almost no calories or fat. Now I'm feeling much better about having mushrooms again in my diet!